Hooked on resist lately... it is soo easy to add coloring to a stamped image. I had a couple of these flowers already embossed and inked - so one of them found a home on this simple kraft background. 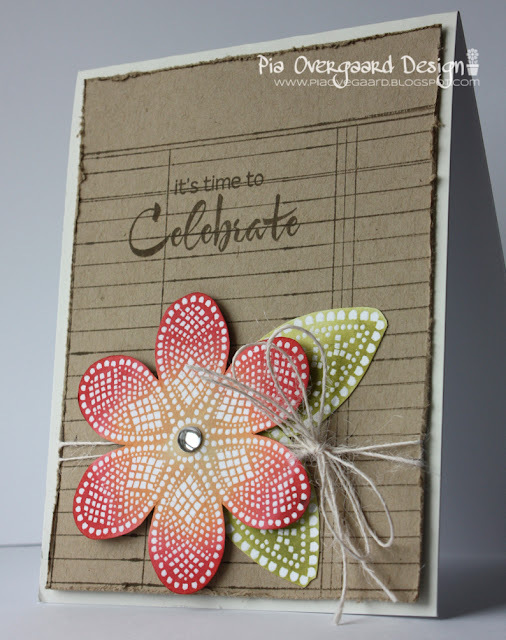 The sentiment is a fave of mine from the Find Joy set.The flowers are from this wonderful set from Hero Arts. What a gorgeous card, you have definitely inspired me! Wawww, Pia. Et super skønt kort med nogle flotte stempler. Hvor er det et flot kort. enkelt og elegang. Jeg har helt glemt det baggrundsstempel. Dejlig at få inspiration til at få gang i det stempel igen. Tak for det, Pia. Hvor er det smukt. Lækker, lækker blomst. Og flot farve mod kraft papiret. This is gorgeous Pia, love the colors on your flower, your work is always inspiring! Hi Pia! I found you on the Hero Arts Flickr page...love your work so much! This card is just lovely. I'll be back to check out more! Have a wonderful day.